Mira is just beginning her senior year of high school when she discovers her father with his male lover. Her world and everything she thought she knew about her family is shattered instantly. Unable to comprehend the lies, betrayal, and secrets that unbeknownst to Mira have come to define and keep intact her family s existence, Mira distances herself from her sister and closest friends as a means of coping. But her father s sexual orientation isn t all he’s kept hidden. A shocking health scare brings to light his battle with HIV. As Mira struggles to make sense of the many fractures in her family’s fabric and redefine her wavering sense of self, she must find a way to reconnect with her dad while there is still time. I’ve had Skyscraping sitting on my shelf for a while now after it was recommended on a YouTube channel. I picked it up solely for the reason that it is written completely in verse, and since i adored the writing style of One by Sarah Crossan, i wanted to explore this way of writing more. Mira just wants a normal life, to go to college and explore the meaning of everything she possibly can in depth. That is until her family is rocked with the news that her parents have been living in an open marriage and her father is fatally ill. She has to figure out the depths of her families relationships and figure out what is most important to her. I was expecting to like this novel because of the style, but i ended up loving the storyline so much more. I wasn’t expecting it to go in to so much depth of these characters lives and their family dynamics, but it was a welcomed surprise. I wouldn’t say that i completely fell in love and connected with the characters individually, but i certainly was invested in them towards the end. I would have liked to explore some of the other characters that weren’t Mira in depth a little more personally. Another great thing i think Cordelia incorporated in to this novel is the non-cliched storyline that allowed different topics to be discussed. AID’s is a big part of this story, and that’s not something i’ve read an awful lot about, especially in YA fiction. It was greatly appreciated that Skyscraping brought a whole new light in to situations i wouldn’t have thought too much about before. The strong point of this novel was obviously the way it was written. I’ve found with novels that are written in verse, they tend to discuss matters that aren’t discussed in other novels often (such as AIDS and conjoined twins) and it really makes the storyline so much more interesting. Skyscraping was written beautifully and i’d recommend it to anyone who wanted an easy read but was written with passion. It’s been a long time since i’ve read a novel that i fell in love with the writing of it, this changed that. I really did enjoy this read, it was fast paced, interesting and made me think a lot about how space and time is made up. My one down-side is that i did not connect with any of the characters too well, but this may just be a personal thing. I’d definitely recommend trying Skyscraping if you enjoy novels told in verse. I’m so glad to hear you liked this one! I’m a big fan as well, and I loved the writing-in-verse style. 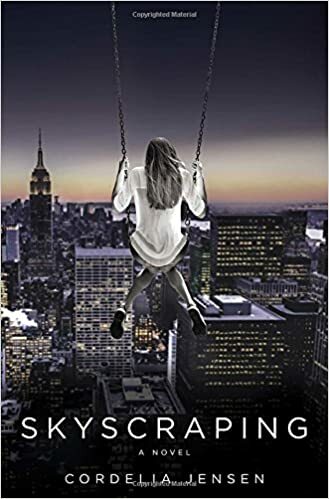 I can be picky about novels that take the verse approach, but it worked so well for Skyscraping – the broken lines really convey the sadness that Mira is feeling. I agree that it was a *bit* hard to connect to some of the characters (I guess that’s a side effect of poetry as well? ), but I still loved the book and its less-commonly-seen setting/subject matter. Hopefully Cordelia Jensen’s next book will be just as fantastic!